Primary Natural Resources forests, minerals, gold. PALAU (OR BELAU to its natives) is one of the world’s newest nations, finally securing independence (in Free Association status) with the UNITED STATES in 1994 after nearly two decades of struggle. As part of the United Nations Trust Territory of the Pacific, Palau formed the westernmost component of the Caroline Islands but opted for separation in 1978 instead of joining the rest of that group as the independent Federated States of MICRONESIA. Today, known as one of the world’s most attractive diving and snorkeling centers, Palau continues to develop its own identity separate from U.S. military requirements yet dependent on U.S. fiscal subsidies. The Republic of Palau consists of six island groups, made up of a more than 300 islands, with a total coastline of 942 mi (1,519 km). The largest island, Babelthuap, dwarfs the others in size, and is the only one of the group with significant elevation. 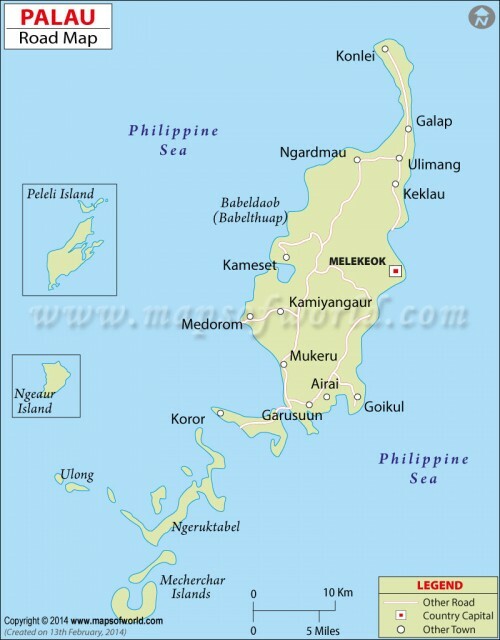 The rest are low coral islands, fringed by large barrier reefs. The chain stretches across 434 mi (700 km) of the western PACIFIC OCEAN, 496 mi (800 km) east of the PHILIPPINES. Originally two main confederations of chiefdoms, the islands were annexed by SPAIN in 1886, purchased by GERMANY in 1899, annexed by JAPAN in 1914, then occupied by the United States in 1945. Formally put under the jurisdiction of the United States as part of the Trust Territory in 1947, the islands were developed as an important naval station. This was a major cause for delay of ratification of Palau’s independence, because of the locals wanted to be nuclear-free. The Free Association Compact that was finally ratified in 1993 provides Palau with up to $700 million in aid over 15 years in return for continued use of military facilities for 50 years. Yet in August 2003, Palau joined with several other countries in signing a comprehensive Nuclear Test Ban Treaty, provoking a statement from the U.S. secretary of state that America would not rule out the possibility of future testing in Palau. The population (mostly living in the Palau cluster) relies on industries related to tourism (services and craft items from shell, wood, pearls) and developing fisheries and garment industry. One of the largest agricultural products is marijuana. The constitution of 1979 was designed to incorporate both Western ideas of democracy and individual liberty and traditional forms of communal ownership and hereditary political systems. The people thus retain more of their indigenous culture than most postcolonial societies, highlighted by the fact that Palauans have the only active indigenous movement in Micronesia: the United Sect (Ngara Modekngei), practiced by about a third of the population. Palau’s strength lies in this cultural heritage and the islands’ remarkable beauty.